“Foley, anche l’Italia ha un rapper jihadista è Anas El Abboubi, da Brescia ad Aleppo,” Il Fatto Quotidiano (Milan), August 23, 2015, http://www.ilfattoquotidiano.it/2014/08/23/foley-anche-litalia-ha-il-suo-rapper-jihadista-anas-el-abboubi-da-brescia/1097416/. According to the U.S. Department of State, El Abboubi has been fighting for ISIS since September 2013.“State Department Terrorist Designation of Anas El Abboubi,” U.S. Department of State, September 28, 2016, http://www.state.gov/r/pa/prs/ps/2016/09/262527.htm. He was previously arrested by Italian counterterrorism police in June 2013 for jihadist propaganda—including his blog titled “Sharia4Italy”—and incitement to racial hatred.“Foley, anche l’Italia ha un rapper jihadista è Anas El Abboubi, da Brescia ad Aleppo,” Il Fatto Quotidiano (Milan), August 23, 2015, http://www.ilfattoquotidiano.it/2014/08/23/foley-anche-litalia-ha-il-suo-rapper-jihadista-anas-el-abboubi-da-brescia/1097416/. While in Italy, El Abboubi allegedly plotted to carry out acts of domestic terrorism. Police in the Italian city of Brescia stated that El Abboubi had utilized Google Maps to search for potential targets. One of his targets included the barracks in the Italian city of Goito, which houses members of the Italian military.Wilma Petenzi, “Esplora il significato del termine: Nel mirino dello studente pure questore e piazza LoggiaNel mirino dello studente pure questore e piazza Loggia,” Corriere Della Sera (Milan), June 13, 2013, http://archiviostorico.corriere.it/2013/giugno/13/Nel_mirino_dello_studente_pure_co_0_20130613_7fe5f472-d3e9-11e2-8ada-521e7e602088.shtml. Another target allegedly included the crowded Brescia train station through which thousands of commuters pass each day.“Terrorismo, voleva colpire la Stazione di Brescia e l'ex caserma Goito,” BSNews (Brescia), June 12, 2013, http://bsnews.it/notizia.php?id=25941. El Abboubi was arrested in Brescia, Italy, on the morning of June 12, 2013, on charges of recruitment with the intent to commit acts of international terrorism and inciting discrimination and violence on the basis of race, ethnicity, and religion.“Terrorismo, arrestato 21enne: cercava obiettivi,” Corriere Della Sera (Brescia), June 12, 2013, http://brescia.corriere.it/brescia/notizie/cronaca/13_giugno_12/terrorismo-marocchino-arrestato-2221605936503.shtml?refresh_ce-cp. He was briefly imprisoned. Following his release, the prosecutor filed an appeal asking that he be re-incarcerated. The appeal was rejected. 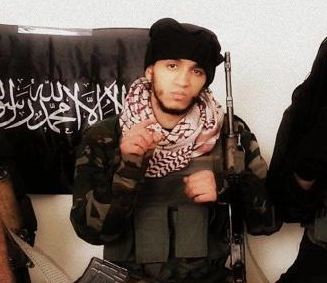 In October 2013, El Abboubi allegedly traveled to Syria where he reportedly joined in the fighting. El Abboubi’s father confirmed that he had left for Syria. “Foley, anche l’Italia ha un rapper jihadista è Anas El Abboubi, da Brescia ad Aleppo,” Il Fatto Quotidiano (Milan), August 23, 2015, http://www.ilfattoquotidiano.it/2014/08/23/foley-anche-litalia-ha-il-suo-rapper-jihadista-anas-el-abboubi-da-brescia/1097416/. One month later in November 2013, photos appeared on social media depicting El Abboubi holding a Kalashnikov, as well as an audio recording of El Abboubi explaining his decision to embrace Islamic law and fight alongside Syrian rebels.“Arrestato a Brescia, è in Siria a combattere per la Jihad,” Brescia Today, November 9, 2013, http://www.bresciatoday.it/cronaca/brescia-vobarno-anas-el-abboubi-jihad.html. It is unclear whether Sharia4Italy ever evolved beyond El Abboubi’s blog into an active organization similar to Sharia4Belgium, which has utilized the Twitter hashtag #sharia4Italy. Postings under this hashtag have included photos supportive of ISIS as well as maps of Italy, appearing to indicate that the propagandists hope the country will one day fall under the yoke of Islamic law.Sharia4Italy Twitter hashtag, accessed July 27, 2015, https://twitter.com/hashtag/sharia4italy. In or around 2012, El Abboubi was featured on an MTV Italy special entitled “In the Rhythm of Allah,” in which he showcased his hip-hop and rapping skills.“MTV NEWS NEL RITMO DI ALLAH storia.mp4,” YouTube video, 9:23, posted by “metroitalia,” March 9, 2012, https://www.youtube.com/watch?v=EObUCoujN0o. He called himself “Mc Khalifh” and expressed his preference for “angry” music. He also discussed his love for Brescia—a city in northern Italy—and spoke with a notably Brescian accent. El Abboubi said that he had “clear ideas” about his religious faith, and that “tolerance is the principal point in order to prove that you are a good Muslim.”“MTV NEWS NEL RITMO DI ALLAH storia.mp4,” YouTube video, 9:23, posted by “metroitalia,” March 9, 2012, https://www.youtube.com/watch?v=EObUCoujN0o. Anas al Italy“Foley, anche l’Italia ha un rapper jihadista è Anas El Abboubi, da Brescia ad Aleppo,” Il Fatto Quotidiano, August 23, 2014, http://www.ilfattoquotidiano.it/2014/08/23/foley-anche-litalia-ha-il-suo-rapper-jihadista-anas-el-abboubi-da-brescia/1097416/. Mc Khalifh“MTV NEWS NEL RITMO DI ALLAH storia.mp4,” YouTube video, 9:23, posted by “metroitalia,” March 9, 2012, https://www.youtube.com/watch?v=EObUCoujN0o. The U.S. Department of State designated “Anas El Abboubi” as a Specially Designated Global Terrorist pursuant to Executive Order 13224.“State Department Terrorist Designation of Anas El Abboubi,” U.S. Department of State, September 28, 2016, http://www.state.gov/r/pa/prs/ps/2016/09/262527.htm. Anas El Abboubi is an Italian citizen of Moroccan descent and a U.S.-designated foreign fighter for ISIS.“State Department Terrorist Designation of Anas El Abboubi,” U.S.
“Tell me, tell me o mujahid, tell me what inspires you, if death frightens you, if vendetta pleases you, if the blood of the enemy doesn’t sate you, prepare yourself for the fight, paradise awaits you.”“Foley, anche l’Italia ha un rapper jihadista è Anas El Abboubi, da Brescia ad Aleppo,” Il Fatto Quotidiano (Milan), August 23, 2015, http://www.ilfattoquotidiano.it/2014/08/23/foley-anche-litalia-ha-il-suo-rapper-jihadista-anas-el-abboubi-da-brescia/1097416/. “Martyrdom seduces me, I want to die armed, my goal is the crusade.”“Foley, anche l’Italia ha un rapper jihadista è Anas El Abboubi, da Brescia ad Aleppo,” Il Fatto Quotidiano (Milan), August 23, 2015, http://www.ilfattoquotidiano.it/2014/08/23/foley-anche-litalia-ha-il-suo-rapper-jihadista-anas-el-abboubi-da-brescia/1097416/.